On Wednesday, November 9, 2016, 6 - 8 pm, at the City Hall Atrium, Second Floor, 30 Church St, Rochester, NY 14614, the City of Rochester will unveil the latest progress in its Climate Action Plan (CAP). You can drop in anytime during these hours and engage the City on its CAP before this plan is submitted for approval. This meeting gives the Rochester public a chance to explore the myriad ways the CAP can address the local threats from Climate Change. Our region is already experiencing more extreme weather in the form of heavy precipitation events—71% since 1958. There will also be more heatwaves, droughts, public health issues and continual disruptions to our infrastructures-- water, waste, transportation, energy, and telecommunications. For a more comprehensive list of how Climate Change is already affecting our region check here and for a list the likely of consequences coming, check here. These disruptions will affect all of us but they will affect disadvantaged communities first and worst. According to ACT Rochester, “Poverty within the City of Rochester continues to be extraordinary, with a rate of 33.8% (up from 31.1% in the first report).” Much of the misery and stress of being poor is the lack of jobs, the means to get to them, adequate health coverage, and affordable housing that is properly heated or cooled for the vagaries of our Northern climate. During and after extreme weather events (like Hurricane Sandy and Katrina), disadvantaged communities not only get less help and less protection by their governments, they receive less (if any) of the recovery aid and the means to relocate. (This is one of the reason why our poorest areas also are the most polluted from abandoned Brownfields—folks who could get up and move already did that.) Climate Change amplifies and accelerates most of the stress by those without the financial resiliency to bounce back from tragedy. Too often Climate Change has been viewed by the public and our officials as just another of the many serious problems we must address. But Climate Change isn’t going to be added on to the problems in your life, it’s going to be the new normal that you will be living in. Like a fish put into your aquarium, it’s not ever going back to its old home. When viewed this way, the solutions for many of our social and health problems can be tackled as we address Climate Change locally. As we improve the lives of our least fortunate in a warming environment, we raise the security and quality of life for everyone—regardless of race and economic circumstances—in our Rochester region. 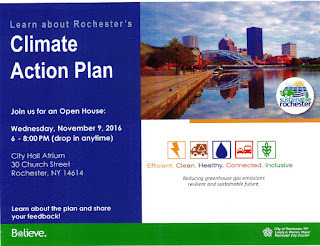 Appropriately, the City’s Climate Action Plan is part of its Comprehensive Plan Update – Rochester 4.0 because plans for our future absolutely must be part of the all-inclusive challenges Climate Change presents. The main elements of the City’s CAP--energy use and supply, transportation, waste and materials management, clean water, and land use—contain both the climate pressures to our area and the potential answers for a sustainable future. Plans in the CAP include the retrofitting of local buildings to heat more efficiently and lowering heating costs. Better public transportation and increased safety for active transportation (walking and bicycling) will offer low-cost solutions for getting to essential destinations, like jobs and groceries. Protecting our water and making sure that it’s clean and plentiful before and after climate disruptions will help ensure continued public health. And making sure our urban parks and local infrastructures are resilient and robust enough to withstand the rocky road ahead protects the vital interests of all the people in Rochester. Cities like Rochester are at the forefront of lowering greenhouse gas emissions by providing an existing political framework for common actions. The Climate Change challenge may well be ‘won or lost in cities’. Many local groups and organizations, like the Rochester People’s Climate Coalition, have participated in the City’s CAP outreach program for the last year working to tailor this plan and make it sensitive to the needs of our city. I encourage community leaders, especially those in disadvantaged communities, to bring their constituents to this important public meeting at City Hall and be an integral part of the City’s plans. Many jobs, better public health, more accommodating public transportation can be realized if the voices who have hitherto been quiet on Climate Change speak up so that their city hears them.